REMOTE CONTROL ACTUATORS – RCI 200 Series The Remote Control RCI 200 Series Pneumatic Actuator features a modern scotch yoke mechanism for high starting and ending torques in a very compact package. Available in both double acting and spring return in 8 sizes with torques to 38,720 in. lbs., it offers great flexibility. The spring return actuator features a spring module with the spring(s) safely contained and epoxy powder coated for maximum corrosion resistance. Our pistons are guided in two places with reinforced TeflonTM bearings which insure positive alignment and long seal life. All RCI 200 Series Actuators carry a 3-year warranty. The RCIO size has adjustable travel stops in both directions. RCI 400 Series The Remote Control RCI 400 Series offers a lower cost alternative to our highly successful scotch yoke design. The addition of this product broadens Remote Control’s ability to satisfy all rotary, pneumatic actuation and fills a positive position within our family of actuators. The rack and pinion design provides constant torque in the double acting version, as required in some valve types, and a linear characteristic in the spring return version. The 400 Series actuators have adjustable travel stops in both direction + or – 5 degrees. The use of high quality materials, high standards of manufacturing and attention to detail, make this actuator an excellent choice for most actuation applications. RCEL Series Remote Control RCEL Series Electric Actuators are engineered to provide efficient, high performance automation of quarter turn valves. The RCEL Series has improved reliability incorporating all the best features. The maximum torque output range is 521 inch lbs. to 21,700 inch lbs. 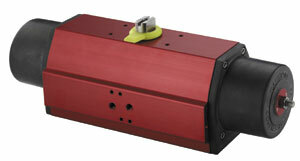 The RCEL actuators are CSA C/US approved in 120VAC models. The RCEL actuators have a number of options. For more information on the RCEL electric actuator refer to the RCEL datasheet in the product section of our website.